Sunny skies. High near 90F. Winds S at 5 to 10 mph..
A mostly clear sky. Low near 55F. Winds WSW at 5 to 10 mph. 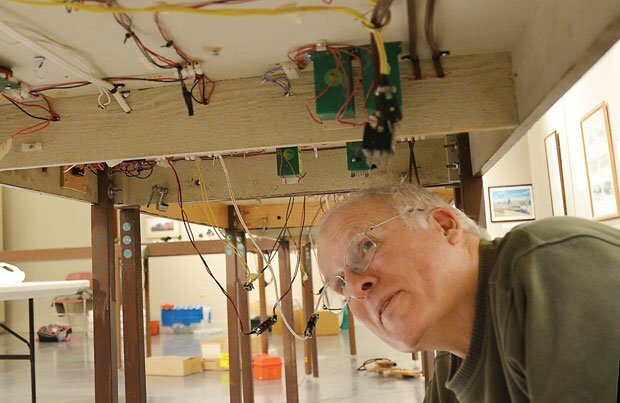 Before the exhibition’s opening, show run coordinator Steve Lewis checks the complicated wiring that connects each modular set, ensuring the smooth running of the trains. Twelve-year-old Allie Foster created a snowy hillside scene for one of the modules. Dani Foster of Santa Rosa joins fragile lengths of track on a hilly module that includes sheep, cattle, a windmill, a train bridge and a railroad tunnel cave-in. Electrical wires, their ends wrapped in insulating tape, dangled under modular tables. Spread over nearly every surface were extension cords, clamps, screwdrivers and pliers of various sizes, carpenter’s levels and water bottles as well as the occasional pair of workman’s gloves. Lids were open on serious-looking toolboxes. Hand trucks and backpacks lined the outer walls. Setting the tone for the scene was the whine of power tools. A typical exhibit installation day at the Napa Valley Museum? Seemingly, until the discovery of tiny plastic animals — both zoo, farm and domestic — and miniature people just the right size to fit in equally miniature versions of railcars and vintage and classic automobiles. And more to the point, containers of trains: freight trains, passenger trains — both diesel and steam — coal cars, boxcars, flat cars, well cars, tank cars, grain hoppers and locomotives. Twenty-four hours before the opening of the Coastal Valley Lines model railroad club’s two-week exhibition, CVL members Blain Hendrix and show run coordinator Steve Lewis were installing throttle pockets, metal sleeves that hold the electronic throttles controlling the model trains chugging along hundreds of feet of track. Another CVL member, Peter Barnes, was sprawled under a display trying to solve an electronic malfunction. 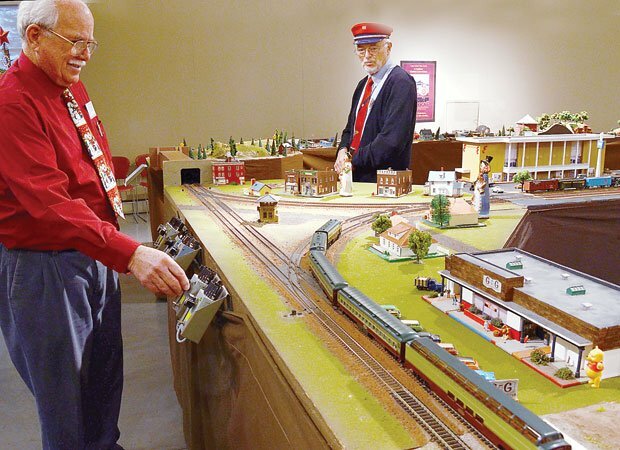 Jim Baier was working on a display revealing the mysteries of model railroading’s scales and gauges. Dani Foster, using two tiny screwdrivers, was carefully joining lengths of track curving past a tree-covered hillside dotted with grazing cattle and sheep. By the following day, club members, with help from neighboring railroading clubs, had worked their magic and connected 38 modular tables depicting scenic hills, lakes, small towns and farms, tunnels and covered bridges, rail and stock yards, pavilions and ski slopes. Past them all ran the tracks and trains in a visual celebration of a mode of transportation that for generations has fascinated young and old. The trains included the familiar and the not-so. Among the locomotives and rolling stock were the Napa Valley Wine Train, Amtrak’s California Zephyr, Southern Pacific, Western Pacific, Union Pacific, New England, North Western, Texas and Pacific, California Northern, and Central California Traction Company RR, as well as Canadian Pacific, Canada Northern, the Newfoundland Bullet (an ironic moniker that Lewis is happy to explain), and a collection of European trains with their fixed wheels and distinctive buffers. One of the exhibit’s youngest fans could easily have been 3-year-old Magnus Scheller of Angwin, who arrived one rainy afternoon soon after the opening with his mother in tow. Barely tall enough to see over the edge of the layout, the youngster made his way slowly down one side and along another, hands at his sides, eyes wide and intent on the trains and the miniature scenes. The title of oldest enthusiast might have been claimed by a former CVL member, the late William Patterson. Model railroader Skip Rueckert pointed out a miniature cabin set against a realistic-looking hillside. Sure enough, Rueckert had included a to-scale figure, Patterson, relaxing by the cabin’s porch, watching the trains go by with a cheerful pooch at his side and potted plants on the windowsill. Rueckert’s remarks underscored another aspect of model railroading that appears almost as important as running the trains — setting the scenes. Some are accurate, others fanciful. Still others reflect the creator’s sense of humor. A chimpanzee, for instance, shares a train’s flatbed with vintage trucks. A kangaroo peers from the roof of a packing company. Elephants share a pen with a passel of hogs and Winnie the Pooh welcomes supermarket shoppers. But he persevered and the result looks as authentic as the real thing. He also made a replica of Santa Rosa’s G&G supermarket, which has since been remodeled, and a “round barn” that is actually not round but 16-sided, he noted. Foster’s 12-year-old daughter, Allie, has also caught the model railroading bug. She created two of the scenes in the exhibition, one of a snowy ski slope complete with lodge, skiers and a ski lift. The other is a one-farm town with a water tank and depot. One of Lewis’ contributions grew out of a windmill he was building, then stepped on. He used it as a main element in his Calamity Junction set, which includes an overturned Corvette, its two passengers lying on the roadside blocking a line of Model A Fords and emergency vehicles. Even in miniature the original scene caused concern among certain viewers, he said. It was Lewis’ wife who suggested that the scene probably triggered an unhappy memory, so Lewis changed the scene’s possible outcome by adding an ambulance and covering the tiny passengers. There is more to see in the club’s 1,500-plus square feet of layout, but only three days left to see it. The holiday exhibition runs through Sunday, Dec. 16. After that, CVL members will pack up the trains, the scenes, the modular tables and carry them off, along with some of the magic. • The Holiday Train Exhibition at the Napa Valley Museum, 55 Presidents Circle, Yountville, runs through Dec. 16. • Admission is free for museum members and $5 for guests. • The museum hours are Tuesday through Sunday, 10 a.m. to 4 p.m.